The winter league final was held once again on the Fenland Drains and Decoy Lakes on Saturday 25th February 2017. This split format is still in its infancy, however it is proving immensely popular with competitors as once again 34 teams of 10 battled it out for the title. Last year’s champions Browning Ossett were keen to defend the title they won so convincingly last year, however it was local league rivals Drennan Barnsley Blacks who stormed to victory with an impressive 41 points. 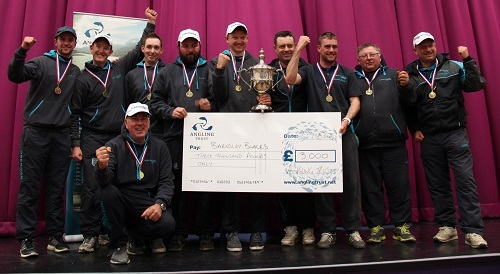 The win completes a fantastic season for Drennan Barnsley who have taken both the commercial national and division one national, along with this title in the last 12 months. Close runners up were Starlets. Their fantastic 43 points total would have been enough to win on many occasions. Completing the podium were Drennan Oxford, who were delighted with their 3rd place finish after putting in weeks of hard work. On the individual front Andy Geldart made no mistake from fancied peg 6 on Lou’s lake. The Drennan Barnlsey man making it a team and individual double with a fine 87kg 200g of carp taken on a mixture of pole and bomb. The drains also fished fantastically well with the top 3 all recording over 15kg. It was Shaun Bryan who took a catch of tench from the bypass section of the Old Nene at March, just beating Rob Wright's fantastic 15kg 100g of roach from the 20ft drain. Poole Summer Evening Specimen League for 2006.